Make marinade and let meat sit in the marinade, covered, in the fridge overnight. Set oven at 125 to 140 degrees and dry for 8 – 10 hours. Leave oven door slightly open for ventilation and check periodically. Enjoy! How many lbs. of chicken is to be used in the Jack Daniels Chicken Jerky recipe? 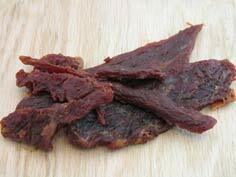 Also is Jack Daniels Jerky recipe good marinate for beef jerky? Generally it takes 3 pounds of meat to make 1 pound of jerky, so if you base your measurements off of that you should be fine. Yes, it is good with any meat type, my suggestion would be to make the marinade and then it on both chicken and beef, that way you could even do a taste test and choose your favorite, I promise that you’ll enjoy both of them. For chicken and turkey jerky do you just take the raw white and/or dark meat and cut that into strips? Yes, either white or dark will work just fine for both Chicken and Turkey Jerky. Please visit us again and leave a review, we’d love to hear how it turned out and what you thought of the recipe you chose. Can you also make this in a food dehydrator? I am thinking of getting one. Would the amount of “cooking” time change? Thanks, I’d really like to try this recipe – I just discovered your site. Our family just got a dehydrator for Christmas, I was wondering if you might have some suggestions on cook time for that? If you dehydrate poultry it’s best to pre-cook it till it’s almost done, electric dehydrators just don’t cook them fast enough, so bacteria can form. Where does one find Chipotle Raspberry Sauce?